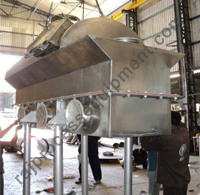 Very versatile process equipment for uniform and efficient drying of products. cGMP model with documentation as option. AISI 304 / AISI 316 / Custom made. Chemical / Fertilizer / Food - salt, sugar / Mineral - Sand, Aluminum / Ore calcining / Metal oxidation / Sludge Incineration / Pyrolysis of Plastic Waste / Pigment etc. Capacity available from 5 kg/hr to 2000 kg/hr water/solvent evaporation.